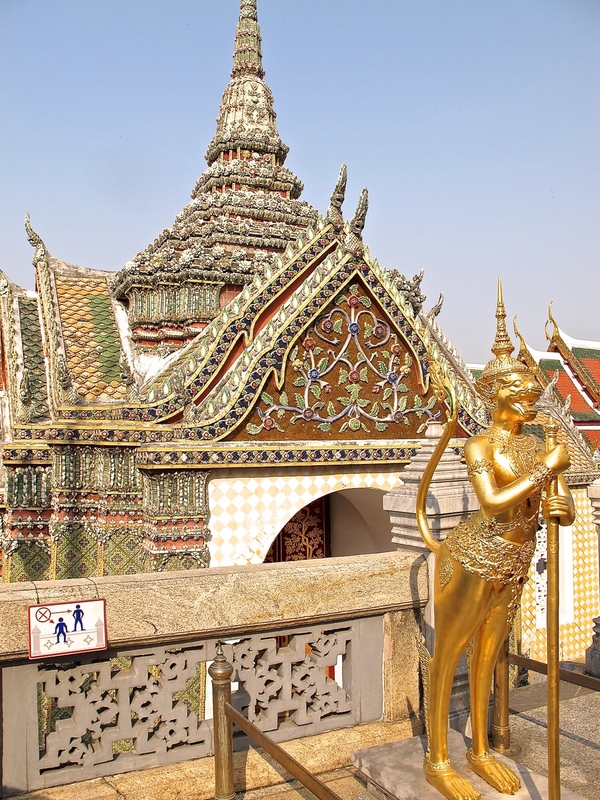 The final leg of our Southeastern Asia trip was to Bangkok, Thailand. This was the one city I had visited before. From my previous trip over a decade ago, I remember traffic, smoldering hot and humid weather, unbreathable air and fantastic temples and food. I was curious to see what had changed. I didn't think it was possible, but the traffic had gotten worse. One day, we were trying to get to Chinatown, and when we only moved 10 feet in 20 minutes, we were forced to give up. The weather was warm, but palatable. The humidity wasn't in full swing, so it was manageable. The pollution had cleared a bit. I wouldn't compare the atmosphere to clear mountain air, but you could see through it, most of the time, and inhale without feeling like you just smoked a pack of menthols. And best of all, the temples were still jaw dropping. I didn't remember how impressive and ornate the Grand Palace was, which seems hard to fathom when standing in front of it. 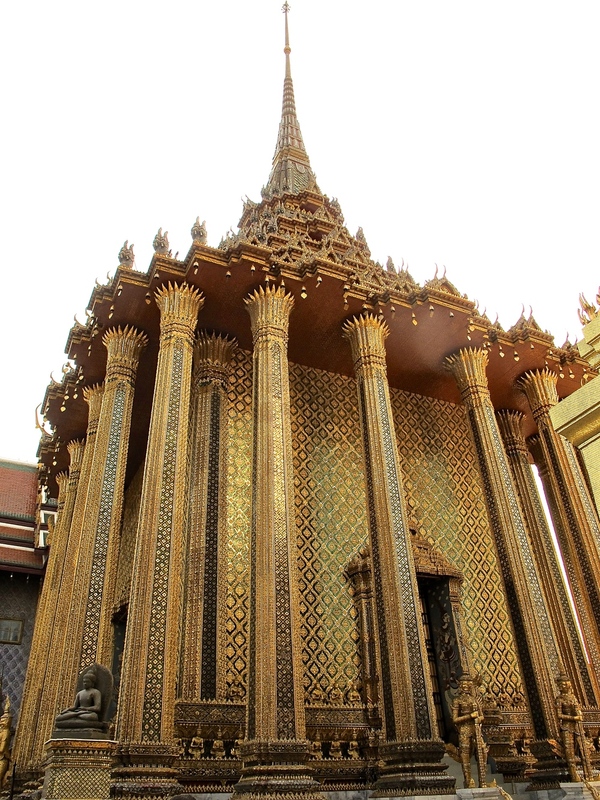 The Palace was built in 1782, after King Rama I ascended to the throne. Rama didn't think the old digs across the river were suitable so he built this modest spot for both his home and office. Good thinking. The Palace contains a collection of reception halls, pavilions, gardens, courtyards and administrative building. I think we have some people in the US who could stand to talk to some Thai architects on how to design an administrative building for a very specific wow effect. There's also the Temple of the Emerald Buddha. No pictures allowed here, shoes off, legs and shoulders covered. The Buddha was carved from a block of green jade, found in 1434, and originally hidden under plaster. It wasn't until later the jade was revealed and then revered and worshipped. The Grand Palace still houses several royal offices on site. Not far from the Grand Palace is the Reclining Buddha, aka Wat Po. Yes, they worship Buddha in many forms, in many places, all over Thailand. This is one of the largest buddhas, measuring in at over 150 feet long, and nearly 50 feet high. In case that didn't make a big enough statement, the Reclining Buddha is also covered in gold leaf, making it quite a sight to see. 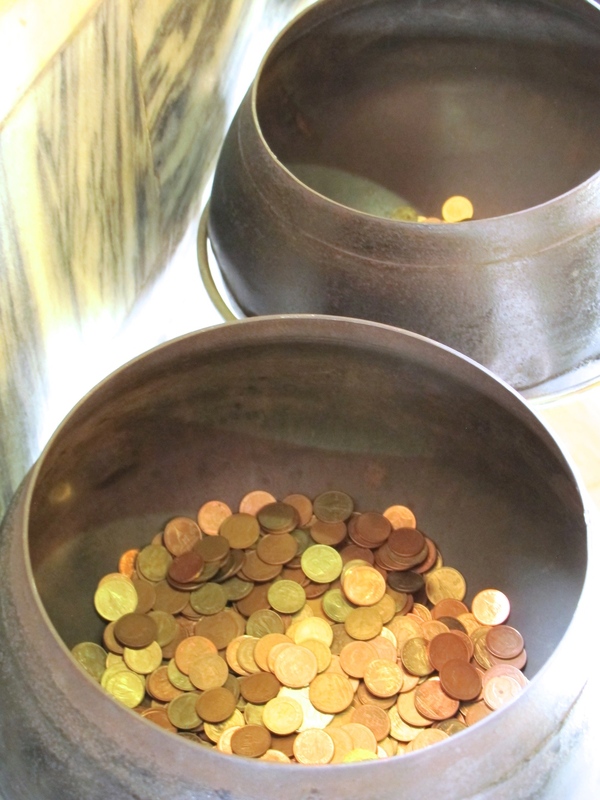 There are 108 bronze bowls behind the Buddha where you can purchase 108 coins and drop one in each bowl for good luck. I thought I was going crazy listening to consistent clanking while admiring the Buddha, until I walked around and saw what was happening. I didn't have a lot of time in Bangkok to see anything outside of the major attractions, but we did get in another Buddha visit and also experienced life on the water with views of more temples, home and shops that faced the Chao Phraya River. We also had to take one of the 3-wheeled tuk tuks. No really, we had to because the traffic was so bad otherwise. It's one of the more efficient ways to travel, assuming you don't have too far to go. I couldn't leave Asia without visiting one more market for both flowers and food. The local orchids were vibrant pinks and purples, while other flowers were made into gifts and rings. People were prepping for Chinese New Year so colorful flowers flowed everywhere. The food of Thailand, especially compared to Vietnam, is full of more pronounced spices and heat from different kinds of peppers. Vietnam's cuisine was subtle and fragrant while Thailand's was in your face and powerful. I enjoyed a meal of some interesting Thai dishes at Baan Khanitha in Asiatique, a newer outdoor shopping, dining and entertainment market on the water. It's Bangkok's version of the 3rd Street Promenade in Santa Monica. Baan Khanitha uses organic fruit and vegetables from their own farm and has been in business in Thailand for nearly two decades. The Meang Kam is a Thai version of lettuce cups or in this case, food wrapped in leaves. There were nuts and onions, peppers and chewy dried shrimp all topped with a sweet, sticky lemongrass, galangal, fish sauce. A nice way to start a meal. The warm beef and vegetable soup was layered in complex flavors and the steamed snow fish was bathed in additional Thai spices like whole peppers, lemongrass, chili and lime. I had a local beer in nearly all of the places we went, so on my final South East Asia post, I'll end with a toast to an amazing, eye opening trip to a truly different, unique and beautiful place. If you missed any of the stories from SE Asia, you can catch up here. The Taj Mahal is on many people's bucket list to see, but is it the highlight of a trip to India? It depends on what kind of traveler you are. Here's my opinion. Some say Rishikesh India is the birthplace of yoga. There's no shortage of yoga and meditation centers situated in the small town along the River Ganges. If you're open to the experience, it can be rewarding. Cambodia was my favorite stop of my trip through SE Asia with the unbelievable ruins at Angkor, the color of the local villages, and the evening action on Siam Reap's Pub Street. The scooters returned en masse upon arrival in Ho Chi Minh City, the largest city in Vietnam. Wander the city's sights and vibrant markets, as well as the interesting Cu Chi tunnels, an extensive network of underground tunnels used during the Vietnam War and Tet Offensive. Heading further south in Vietnam towards the coast revealed beautiful islands to explore by boat and cities with bustling food markets and custom made tailor shops. Vietnam is chock full of people, all on their scooters. With 35 million scooters, making up nearly 90-95% vehicular traffic, crossing the street will be one of the major attractions while visiting Vietnam. The food in Hong Kong runs a wide range from snake soup served in the street to 3 star dining experiences with Cantonese specialties like bird's nest soup with fish stomach and braised abalone with sea cucumber. Hong Kong is a packed cosmopolitan city full of people, temples, restaurants, shopping and interesting sites like Bird St. where retired Chinese men pick and hang out with their flying pets. Here are a few highlights.